Worldwide, only 13% of employees are engaged in their work -- that is, they are emotionally invested and focused on creating value for their organizations every day. disengaged" at work, meaning they are emotionally disconnected from their workplaces and less likely to be productive. In fact, actively disengaged workers worldwide continue to outnumber engaged workers at a rate of nearly 2-1. These findings are from the State of the Global Workplace: Employee Engagement Insights for Business Leaders Worldwide, which Gallup released today. This report includes regional analyses of employee engagement data, country-level insights from Gallup consultants around the globe, and a look at the impact of engagement on organizational and individual performance. It also provides advice on what leaders can do to build highly engaged workplaces and improve performance in their companies. Across 142 countries in which Gallup measured employee engagement, 13% of employees are engaged in their jobs, while 63% are not engaged and 24% are actively disengaged. Around the world, job creation is led by organizations that maximize employees' motivation and enthusiasm for their work. Globally, 44% of engaged employees say their employers are hiring people and expanding the size of their workforces, vs. 34% of those who are "not engaged" and just 25% of actively disengaged employees. Active disengagement in the workplace represents an immense drain in terms of productivity and profitability, even for highly developed economies. Gallup estimates, for example, that it costs Germany €112 billion to €138 billion per year ($151 billion to $186 billion) and the U.K. between £52 billion and £70 billion ($83 billion to $112 billion) per year. The region with the lowest proportion of engaged employees is East Asia at 6%. Results here are driven predominantly by China, where 6% of employees are engaged in their jobs -- one of the lowest figures worldwide. Many of the world's largest emerging economies will need to rely less on natural resources and more on the talents and energy of their workforces to continue to grow. However, among 23 emerging economies included in the current study, just 10% of employed residents are engaged -- about half the proportion among employees in 23 developed economies (19%). The highest levels of active disengagement in the world are found in the Middle East and North Africa (MENA) region, particularly Tunisia (54%), Algeria (53%), and Syria (45%). Around the globe, engaged employees are more likely to be "thriving" -- i.e., to rate their overall lives highly on a zero-to-10 scale -- than those who are "not engaged" or "actively disengaged". Engagement is also related to employees' daily emotional states in virtually all regions. 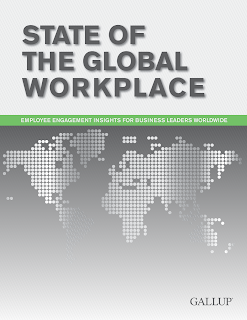 For more global and regional findings and to learn what your organization can do to improve employee engagement, read the State of the Global Workplace report and visit the Employee Engagement page on this site.